Well, it appears that the US jobs market didn't get the memo that a recession is just around the corner. In other words, not only is the US labor market holding its own, it's actually gained momentum in recent months. Moreover–and remarkably–these uniquely strong results are occurring against a backdrop of low, stable inflation, implying that the Federal Reserve could still conceivably pause in their rate-hiking campaign, accommodating job market improvements that are so essential to middle and low-wage workers. Tighter labor markets continue to noticeably boost wage growth, as shown in the two figures below. Nominal hourly wages were up 3.2 percent, year-over-year, for all private-sector workers, and 3.3 percent for middle-wage workers. 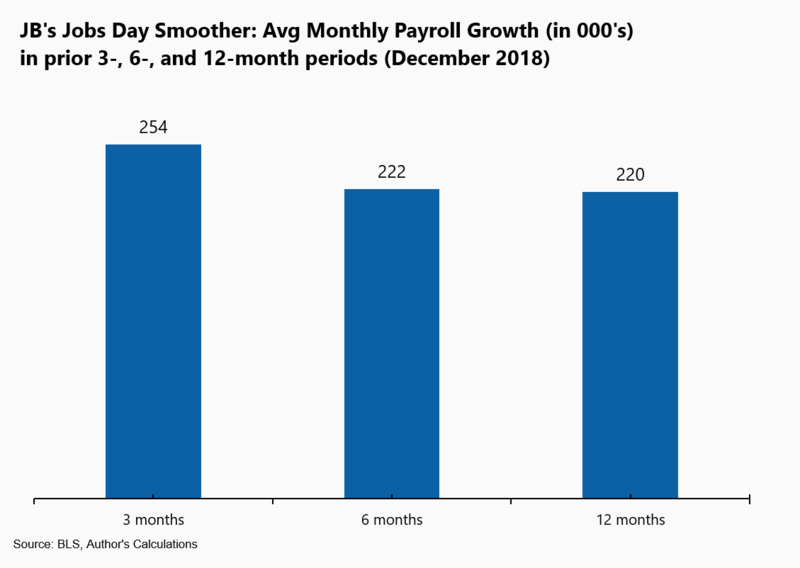 The smoothed, 6-months moving average shows evidence of "wage-Phillips curve" awakening in 2018: low unemployment finally started to correlate with rising pay pressures. As discussed next, thanks largely to low energy prices, I expect real wage growth of over 1 percent for middle wage workers in 2018. While not a particularly high real growth rate in historical terms, it represents an important gain for working families. With today's report, we can evaluate the 2018 job market in historical context, as in the two tables below. The first focuses on jobs and the second on wages. Annual changes are for December 2017 over December 2018; level variables are for December 2018 (all these values may undergo some revisions). 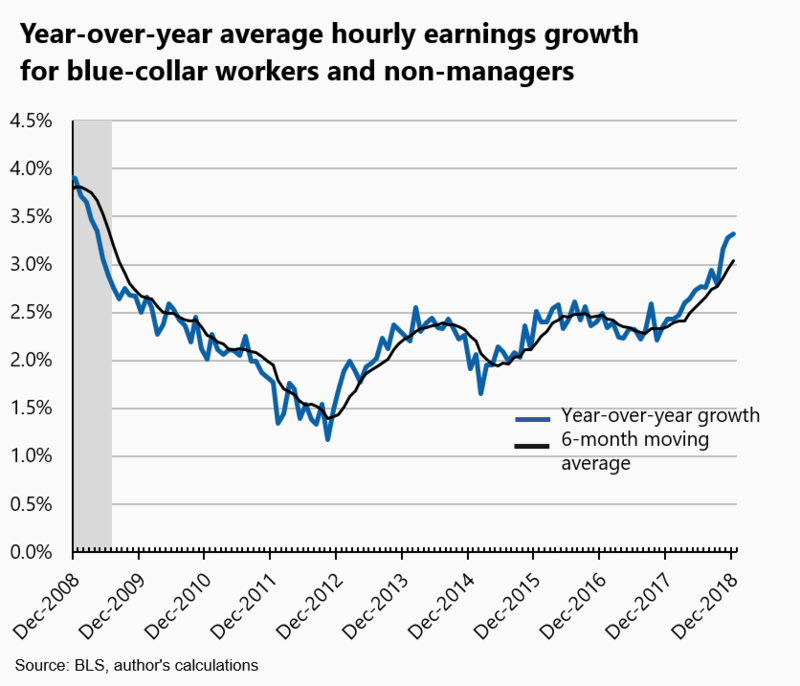 Thanks to the pressure of tighter labor markets, nominal wage growth picked up over the year, as shown in the figures above. But it remains below that of prior peaks. 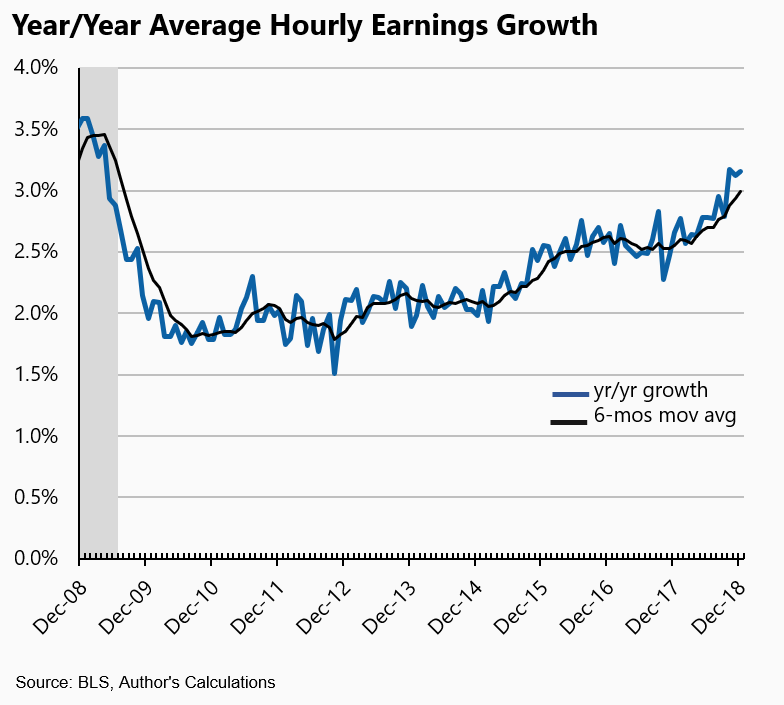 Part of this relates to lower inflation, and, in fact, real wage growth was faster for mid-level workers last year than in 2016-17, at least based on my forecast for December inflation (which isn't out yet; my guess is that CPI inflation is up 2 percent, Dec/Dec). Amidst this positive labor market news, various economic headwinds have kicked up of late. Highly volatile financial markets, Trump's trade war, slower growth abroad, and fading fiscal stimulus are leading to some grim forecasts for near-term U.S. growth. Conversely, low unemployment, job gains, and higher real wages can be counted on to boost consumer spending, which is almost 70 percent of the U.S. economy. In other words, the economy faces both headwinds and tailwinds, with the latter reflecting the job-market induced strength of the highly acquisitive American consumer. 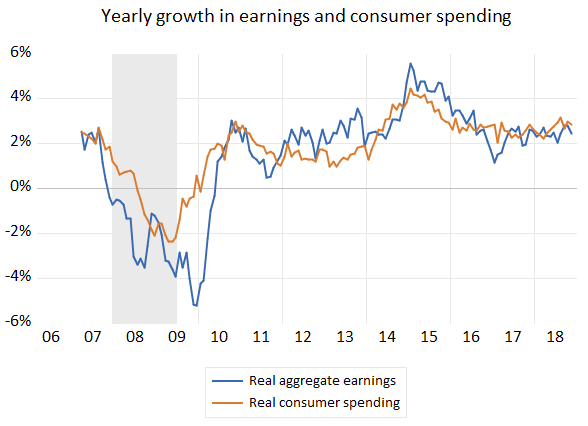 The next figure shows this relationship by plotting yearly growth rates of real, aggregate, weekly earnings (jobs times real wages times hours per week) against real, economy-wide consumer spending (not including December's results). They track each other well, though less so in recessions, when households dip into savings—if they can—to smooth their consumption through down labor markets. Most recently, both series have been steadily tracking 2.5 to 3 percent and my expectation is that this trend will persist, if not strengthen in coming months, as stronger real wage gains support spending.